Garmin introduces the most innovative GPS dog tracking and training collars to date, the Garmin Alpha TT15 GPS track and train collar. This GPS tracking system for dogs is an improvement of the already popular Alpha 100 TT10 system used by many serious hunters and trainers. You can now accurately track and train more dogs than ever before with the Alpha 100 TT15 Combo ! The price depends on products selection. Click Here for our Pro Staff Review Article for Garmin T5 and TT15 Collars. - DC50: Pairing the DC50 collar with an Astro 430 is required before you can track it with the Alpha 100. You can track The TT15 collar with the Alpha and the Astro 430 simultaneously. The Garmin TT15 GPS tracker for dogs is capable of being tracked on either the Astro 320 or the Alpha 100 but not simultaneously. To track the TT15 GPS dog collar be sure to update your Garmin Astro 320 ,430, or Alpha 100 software for best performance. 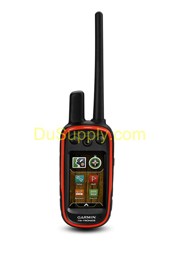 This can be easily achieved by downloading and running Garmin Web Updater or Garmin Express. NEW Vibrate with TT15: Vibrate expands the versatility of the Garmin Alpha TT15 system even more. Users have another option to correct a dog without using electric stimulation. One benefit to hound hunters is being able to communicate with an individual dog without having to shock the dog or alerting the rest of the pack. Linear Mode: We recommend Linear Mode for hound hunters. The simple to use and understand 1-18 levels are in the same range as the Tri-Tronics 1-6, Garmin just added more levels in between. For example, an 18 on the Alpha 100 TT15 Combo is the same as a 6 from a Classic 70 or Trashbreaker. Traditional Mode: Traditional mode allows the user to jump up to higher levels faster. It uses a 1-6 with high, medium, and low for each level. This is the same as what Tri-Tronics used for its Pro Series training dog collars. Tone: The audible tone is a great way to correct a dog without having to use stimulation. For hunters it is a great way to communicate with your entire pack. 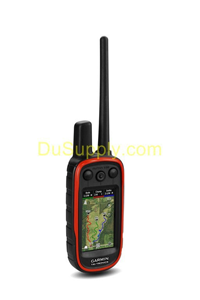 The Alpha 100 is capable of tracking and training up to 20 dogs at one time. This comes in handy for those who either hunt with more than ten of their own dogs or hunt with other people with a lot of dogs on the ground. Never has it been easier for you to link dogs to your buddy’s hand held. With the Alpha 100 you can wirelessly transfer collar data from one unit to the next without having the GPS dog collar in your possession. This makes it much easier to get your partners in on the race while your dogs are already on the track. Keep track of your friends: Not only can you track up to 20 dogs, but you can also track other Alpha 100 handhelds up to 20 units over all. Example: 18 dogs and 2 Alphas or 17 dogs and 3 Alphas. An exclusive feature to the Garmin Alpha 100 is that all communication settings including ID numbers, update rates, rescue mode are changeable on the fly. This is especially helpful when trying to cut dogs off on a road. Being able to change your update rate to 2.5 seconds to help catch a dog on the run is the greatest! No longer are you locked into tracking your collar on either the Astro 320 or the Alpha100. The TT15 can be tracked on either the Astro 320 or the Alpha 100. This will make it easier for folks to upgrade to the Garmin Alpha combo when they can piece together their collars over time. The Garmin Track and Train collar (TT15) has an onboard Tri-Tronics training system with 18 levels of stimulation. Along with momentary and continuous stimulation the TT15 has a tone and newly innovated vibrate mode. Our favorite new feature on the Garmin TT15 Tracking collar is the newly added vibrate mode. This is an addition to the Tone feature most of us are used to as a non-shock stimulation training tool. The use of vibrate allows the user to correct a specific dog without using electric stimulation or alerting other dogs in the pack. The high-sensitivity, top-mounted GPS receiver is now enabled to receive signals from GLONASS (Global Navigation Satellite System) satellites. This adds 21 more satellites signals for your collar to connect with. This coupled with the 28 satellites currently in the GPS system will help cut down on dropping satellite connection while hunting in rugged conditions. When enabled, hunters can see the rate of which their individual dog is barking even when they are too far away to physically hear. The status of each dog’s bark rate can be displayed on both the map and compass screen. If the user wishes, the bark display scale can be turned off on the map screen to keep clutter to a minimum. Users can also choose between 20, 40, 60 or 80 barks per minute (BPM) alert. When a TT15 is linked to an Astro 320 or Alpha 100 and your dog barks more than the chosen BPM it will alert you. This can be a handy tool when your dogs are out of hearing range and you are trying to decipher whether the dogs are trailing or have the critter jumped. This is an invaluable feature that has become a staple with Garmin tracking collars. When activated and the battery on the TT15 drains below 75% of its full charge, the rescue mode automatically changes the update rate from its preselected update rate to 120 second (2 min). 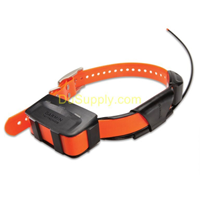 This allows for many additional hours of battery life to help safely retrieve your valued dog. You can also turn this mode off if you wish not to use it. The Garmin TT15 track and train collar comes with a more durable and flexible stainless-steel air craft cable antenna. 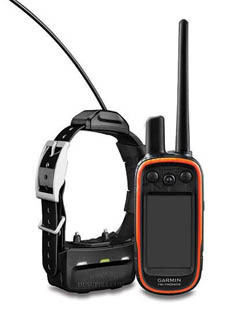 TT15 comes with both 18.5” and 22.5”, with the 22.5” coming pre-installed on the TT15 GPS dog collar from the Garmin factory. Modeled after the Garmin Alpha TT10 and Astro DC50, collar straps on the Garmin TT15 track and train easily slide right through the channels on the collar box, making swapping collar straps easier than ever before. All 1-inch universal collar straps will fit the TT15s. Pick from any one of the 27 different colors provided exclusively from Double U. Order these TT15 replacement straps separately. The USB interfaced charging port allows 3 different charging options: AC outlet, a vehicle charging port and USB port on a computer. This is especially handy when it’s time to run a software update on your GPS dog collar. All you must do is attach the charging clip, plug your TT15 into your computer, and run Garmin Web Updater. 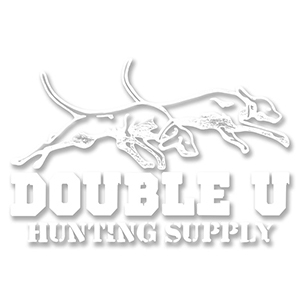 You now have the ability to provide your hunting partners with a track and train code that allows them to fully track and control your dog or can just give them a track code without a train code that will only allow them to track your dog without the ability to shock your dog. Using the updated Alpha 100 or Astro 320, you can change each of your individual dog’s status to best reflect what they are doing. Your options are 1) Pointing ICON, 2) Treeing Treed Alpha ICON, 3) Auto, and 4) None. 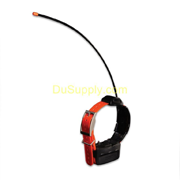 This lets your Alpha or Astro know that when your dog is sitting idle, he or she could be on point or have game treed. With the Garmin TT15, you’ll never have to use zip ties or tape to secure an antenna again. The new TT15 comes with a thick, durable rubber cover sleeve that keeps the VHF antenna erect and receiving communication signals. Along with the rest of the collar, it’s extremely durable and easy to clean. When linked to the Alpha 100, the TT15 can control the Garmin VIRB camera. This would allow a user to be able to see what the dog sees. Alpha 100 Handheld: The Alpha 100 GPS tracker for dogs, runs on a re-chargeable lithium ion battery pack the run time with normal use is between 10-20 hours. This can be prolonged indefinably if the unit is plugged in while riding in a vehicle. TT15 Battery Life: Battery life on the Garmin Alpha TT15 Track and Train collar can vary greatly depending on the update rate used as well as if Rescue Mode has been activated or not. In our own experience with the TT15, on a 10 second update with Rescue Mode turned on we see about 40-42 hours of run time. What’s in the Box for the Alpha/TT15 Bundle?